The image of the European city as a tourist’s paradise of charming inner-city neighborhoods interconnected by high-speed rail networks is not entirely false, but it does not give the full picture of how most Europeans live. Contrary to the mythology embraced by romantics among planners and ‘green’ politicians, urban areas of Europe sprawl just as much as any American or Western city. Of course, there are the wealthy and often childless few who live in the renovated urban cores – but at much lower density than at any time in their history. Instead of crowding picturesquely into city, the teeming hordes of the middle class have sought their refuge in the arboreal outskirts. They drive from their single-family homes and townhouse developments to their offices in old city centers, in business parks on the edge of the center and to other villages with massive industrial parks attached to them. As a result Germany has long since ceased to be the country that one sees in Grimm’s Fairy Tales or Goethe. Much of it looks like America or Canada. Freeways interconnect exurban villages swelling with housing developments and industrial parks. The German dream is a lot like the American one, only with more rules. The most interesting factor is the diversity of these suburbs. They are still predominantly German, but then again so is the country. I live in an exurb of Nuremberg in northern Bavaria. It was the city of Dürer and Hans Sachs as well as the infamous Nazi rallies and post-war trials. It still has castles from the Medieval past, but the need for labor to rebuild destroyed cities – and eventually the resulting prosperity – in the post-war years saw new faces and cultures arrive with immigrants from countries like Turkey. Just like in America, many of these newcomers worked until they retired and decided that they wanted to stay. Some of their children are having trouble but not all of them. The children that move out of their neighborhoods to the suburbs integrate better because their parents tend to be more prosperous and thus resent Germany less. The other reason is the fact they are more exposed to the language. Cem Ozdemir was just elected as leader of the Green Party here and he does not speak the pidgin common among a lot of Turkish immigrants. I moved to the suburbs for much the same reason. My wife and I are both non-native speakers but we know that if our children are going to succeed they will need to speak German well and act like Germans. Ideally they will become hyphenated Germans, as in American-Croat-Germans, which is roughly what they would be. Of course, some recent newcomers still huddle in their ghettos here, the soulless housing estates built to satisfy Le Corbusier’s destructive urban fantasies. But a lot of them are moving out and up. Their ultimate dream is not a castle or a turn of the century apartment. They want their own house. They want decent schools for their kids, a place to park their cars and easy access to work. That is why they are here and not in their old neighborhoods. But diversity is a relatively new benefit of German suburbs. We also moved here for a basic need of space. We had lived in the inner city in a charming apartment but one that simply could not hold kids. It felt cramped just as our offspring popped out. There’s also one often-unrecognized advantage to our suburbia: a stronger feeling of neighborhood. Germany is a country of renters. It can be fairly alienating when the residents have little vested interest in where they live. A lot of rental apartments are in buildings that are anything but charming. Here in the suburbs of Germany almost everybody owns their own home. 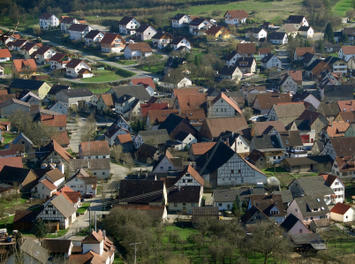 One street is actually named Eigenheimstraße, which translates to Privately-owned-home Street. It is an indication of the pride that Germans have in being able to say that a house belongs to them. They also lovingly tend their yards and fill them with garden gnomes – some harmless, some borderline obscene – and other bric-a-brac that fills countless yards across the urban expanses of America. Then there are the schools. The school system here in Germany is fairly uniform with secondary schools more or less standardized. Performance at the elementary school level is vital: children are clearly, quickly and brutally sorted here. At the age of ten, the teachers decide if a child is going to go to college, vocational school or rot in the festering hell of the Hauptschule. The latter is nothing more than a storage facility for tomorrow’s losers. We moved to make sure that our neighborhood was mainly German. We wanted to make sure that our children were comfortable with the language and they needed friends who spoke German to feel that way. Most immigrant children fail for the simple reason that they don’t speak German at home, and in pre-school most of their friends speak their parents’ native language as well. This means that they speak Turkish or Russian well but can barely express themselves in German. This then puts them at a disadvantage when working their way through the school system. They have to take remedial language courses. The suburbs allow them to avoid all that. The last reason is a place to park our cars. Germans love cars. They love engineering and are very proud of their car industry. They design cars that are the epitome of luxury and performance. Most Germans do not drive cars like this, yet stubbornly continue to own cars despite the government’s multiple efforts to make it too expensive. We pay hefty gas taxes in an effort to fight the “Green House effect,” but most of us feel that it’s just an excuse for the government to steal our money in order to pay for its bloated welfare system. Car-ownership in Europe is almost at American levels and Europeans, despite the much-ballyhooed efforts to introduce bikes in Paris, will continue to drive. As in America, the anti-car and anti-suburban ideologues are loud and active, but as long as people prize security, privacy, space and mobility, it’s likely Europe’s version of the suburban American dream will continue to thrive for years ahead. Kirk Rogers resides in Bubenreuth on the outer edges of Nuremberg and teaches languages and Amercan culture at the University of Erlangen-Nuremberg's Institut für Fremdsprachen und Auslandskunde. He has been living in Germany for about ten years now due to an inexplicable fascination with German culture. Submitted by meela cagney on Fri, 02/27/2015 - 23:15. Submitted by sherkhan on Tue, 09/24/2013 - 02:48. Submitted by RodneyK on Tue, 04/14/2009 - 00:05. To easily convince the tourists to visit a respective place, a person has to provide something visual that could make them imagine the ambiance of the spot. Pictures will do.If you don't have a printer, or you don't have a good one, you could look into Snapfish for picture printing. Snapfish is a Hewlett Packard run web service that will store and print your digital photos for cheap, and for the rest of month, you get 50 free prints and 20 percent off any photo books. However, you have to buy something at least once a year. You won't have to worry about a payday loan to print anything, because prints are 9 cents a piece. Shutterfly, on the other hand, will store everything free, but their prints are about a penny cheaper for the most basic prints. However, it's nice to know you won't need a payday loan for storage devices and printers if you use Snapfish. Submitted by gww99 on Fri, 12/12/2008 - 10:50. It was interesting to read the pushback from the "urban chauvinists" above. Actually, what is going on today in suburban development is a market acceptance of some of the concepts of new urbanism within the suburban context. In many suburban jurisdictions (and fairly conservative ones at that), the easiest way to get a new development approved is for it to be either a TND (Traditional Neighborhood) or a PUD (Planned Unit Development). Older suburbs are developing community centers and certainly are attracting job growth with accompanying office development. One of the challenges is to build affordable or workforce housing within these newer developments. It is often a very tough challenge, especially with fairly common NIMBY bias against more multi-family development. Planning and regulation add costs to new housing. You may well see more bus transit or even small, local bus transit associated with this trend. You will not see absurdly expensive rail transit to mostly declining central cities that continue to lose new job growth to suburbs. Submitted by redisciple on Wed, 12/10/2008 - 14:24. I'm also going to disagree with you on whether German suburbs are like American ones. One major difference is that my German relatives who live in suburbs have a variety of transportation alternatives to choose from, and, although they may love their cars, they'll ride their bike to the bar or take the train into the city. My American suburban relatives have most likely never taken public transportation in their lives, and only consider riding a bicycle for recreation. Submitted by wantwit on Wed, 12/10/2008 - 12:42. I lived in a suburb of Munich for three months and it was nothing like suburbs in the United States. The houses were smaller and more compactly situated. Everything was within easy walking distance, including a clean, reliable commuter rail that whisked you to downtown Munich in 30 minutes. The suburbs of Munich, in other words, are perfect examples of what American New Urbanists are advocating. To equate them with U.S. suburbs because they are both called suburbs is to confuse a name with reality. Submitted by jeffroders on Thu, 12/05/2013 - 02:12. Submitted by mhelie on Wed, 12/10/2008 - 10:58. If that picture is anything like the suburb you live in, then German suburbs are nothing like American suburbs. They are more like a suburb Leon Krier would make. American suburbs are huge, developer-made subdivisions connected to huge commercial strips and huge business parks. There is no pride of ownership because everything was made by a handful of developers - the owners simply bought into it and built nothing themselves - with houses being sold as speculative investments. If you dare place a garden gnome on your lawn, you are likely headed to court. A real place is a marketplace built by many people. The American suburbs are at best a product. Most people who love cities because they are a marketplace cannot express this and will instead find superficial flaws like density and automobile use to attack the suburbs on, but this will not make a marketplace out of suburbia. What's So Great About Suburbia? Submitted by dejaybe on Wed, 12/10/2008 - 10:27. 1) Suburbs don't necessarily have good schools, cities don't necessarily have bad schools, seems like an awfully broad generalization. 2) Renters do not have "little vested interest in where they live". Just because they don't own real estate doesn't mean they don't care about having jobs, safety, a clean environment, etc. in their neighborhoods. Furthermore, doesn't Germany have condos? Some urban dwellers must be homeowners too. 3) Cities offer more space too, but vertically, not horizontally: rent/buy a bigger apartment. 4) To dismiss the threat of climate change is absurd. Suburbs force people to drive everywhere, they are unsustainable. High fuel taxes are sensible public policy. 5) Calling critics of suburbia "ideological" is pretty disingenuous. I could just as easily hurl the same accusation back at you, but I'll stick to a reasoned critique. 6) Assimilation into a culture is possible in a city as long as you don't live in a segregated neighborhood. Submitted by davebarnes on Tue, 12/09/2008 - 14:01. "The German dream is a lot like the American one, only with more rules." Lots more rules. At my house, our city-sponsored recycling effort uses a single bin.